Let’s start today by taking a look at screenshots of three hardly-iconic scenes from three pretty decently-known movies: Jurassic Park 3, Antwone Fisher, and The Sum of All Fears. All three of the images above come from the end credits of their respective movies. 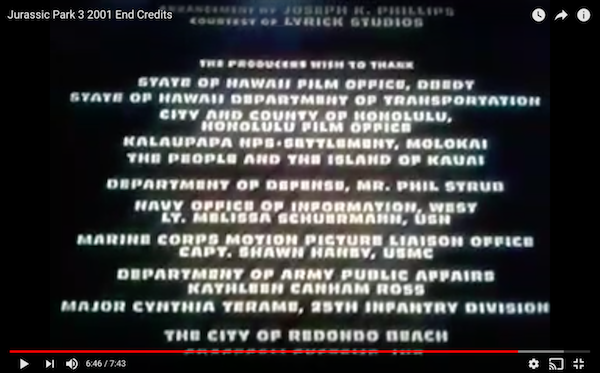 And specifically, we’re looking at the Thank You section — a place in the credits where people who, in various capacities, helped make the movie come to life, but who weren’t working directly on the film itself. It’s a nice way to acknowledge the select few without whom the movie you just watched wouldn’t be possible. Now, take a closer look at the three images above. See anything else tying all three together? 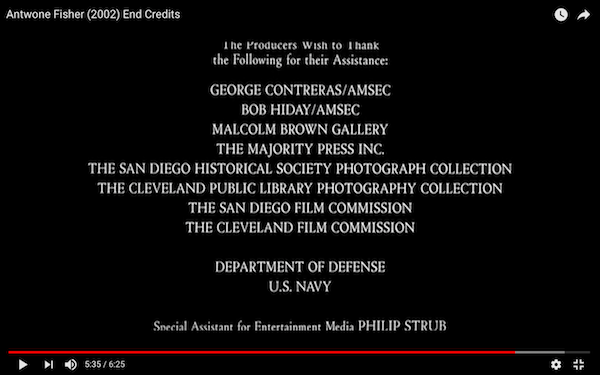 Give it a moment and you’ll see — in each of the three cases, someone named Phil Strub gets thanked. And that’s not as unordinary as you’d think. Film data researcher Stephen Follows looked through all the credits “on the 200 highest-grossing movies at the US box office between 1997 and 2016” and tallied up a ton of data, aiming to determine the most prolific person in Hollywood in many categories, from director and screenwriter to costume designers and stunt doubles. And while he was at it, he looked to see who was the most thanked person in those 4,000 movies. With 46 entries, Philip M. Strub tops the list. Strub’s IMDb page lists him with 52 career “Thanks,” including appreciation-of-note in both Iron Man and Iron Man 2, Blackhawk Down, and a documentary on former Senator Al Franken. So: Who is Strub, and what has he been doing to earn all of that appreciation? Strub doesn’t work in Hollywood — he works in Virginia, and specifically, out of the Pentagon. He’s the Entertainment Liaison at the Department of Defense, a position he’s held since 1989. If movie producers want to shoot a film using military bases, equipment, or the like, they have to go through Strub. 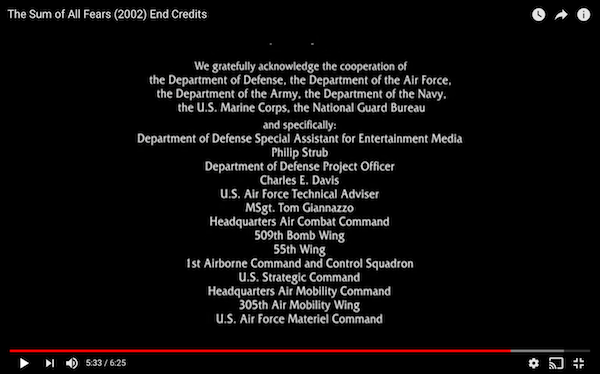 He reviews the scripts to make sure that the film portrays the military in a positive light (and as a result, many commentators disapprove of Strub’s role, calling it more propaganda than anything else). If the script passes muster, Strub is the go-between, facilitating the relationship between the movie producers and the relevant military decision makers. The process can be a collaborative one. For example, while he’s given a mention in the credits of the 2013 Superman reboot “Man of Steel,” that was a close call. He told Fortune (as relayed by Business Insider) that he found the initial depiction of the military as “cartoony” and refused to help the studios. But then, per Fortune, “Warner Bros. asked Strub to reconsider, flying him to L.A. to meet screenwriter David S. Goyer, who modified his script to incorporate Strub’s suggestions.” Ultimately, the movie got made with Strub’s help. But these are the exceptions, not the rule. Hence all those Thank Yous. Bonus fact: If you watch the credits of Pulp Fiction, the second-to-last actor listed is Robert Ruth, and he’s listed as playing the role of “Coffee Shop.” (No need to take my word for it; watch it here.) He wasn’t really a whole coffee shop, though; Ruth’s actual role was as a coffee shop manager — the one whose store is robbed at the end of the movie. But in his brief bit of dialogue (recapped here on IMDb, with R-rated language included), the character, while being mugged, gets his line cut off. Instead of saying “I am not a hero, I’m just a coffee shop manager,” he simply says “I am not a hero, I’m just a coffee shop.” The movie’s writer-director, Quentin Tarantino, decided to memorialize that in the credits as a joke. Ruth is, therefore, probably the only actor to ever be credited as an entire coffee shop. From the Archives: Who’s Sorry Now: A man who gets very few Thank Yous because it’s his job to say sorry.